We offer new homes for sale in south Edmonton’s newest community. Our family neighbourhood is built in one of the most unique locations. Situated alongside the Whitemud creek ravine, The Collections at Creekwood is purpose-built to hug the landscape. 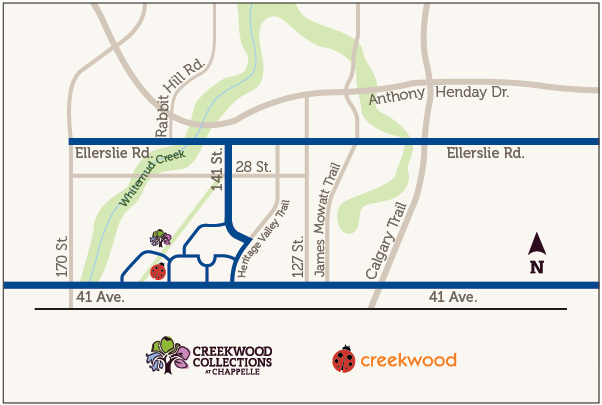 This natural connection to nature, along with our new K-9 school and excellent new home builders make The Collections at Creekwood the best new neighbourhood in south Edmonton. Where do your dreams take shape? Is it on your deck sipping tea on Sunday morning? Is it on the walking trails catching up with neighbours? Perhaps it’s in your reading nook looking at paint swatches for the nursery. No matter what brings you to Creekwood Collections at Chappelle, your path to possibilities is lined with magnificent trees, tranquil views and a unique natural beauty. Whether you are starting your family, designing your dream home, or settling down to watch your grandkids grow, branch out and discover the unexpected in Creekwood Collections at Chappelle. City Homes presents Caspia in Creekwood Collections at Chappelle.